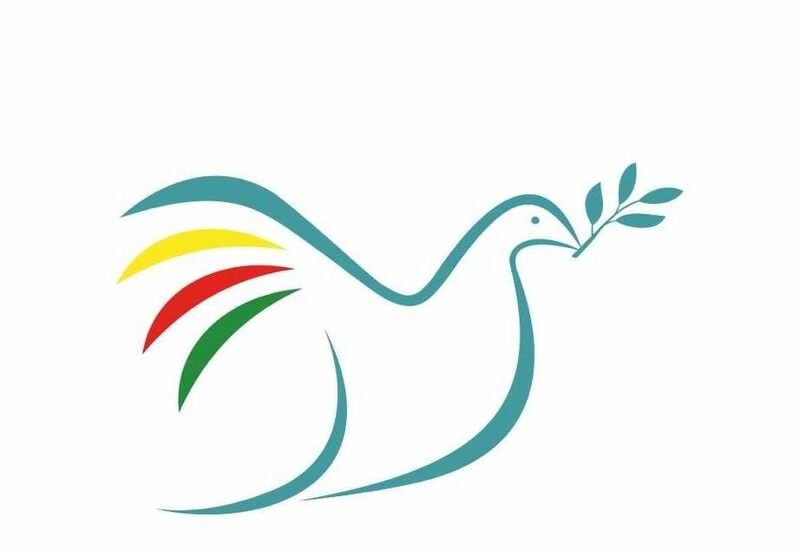 The delegation was organised by Peace in Kurdistan and facilitated by contacts in Turkey, primarily from the Peace and Democracy Party (BDP). The members of the delegation were David Morgan, a journalist, who had visited Turkey on several previous occasions; the last visit being over a decade ago; and Father Joe Ryan, who is the Chair of the Westminster Diocese Justice and Peace Commission, who had also previously visited the country as a trial observer. The delegates spent 5 days in Istanbul, from 28 March to 2 April 2014. The aims of the visit were first of all to observe the conduct of the municipal elections as best we could in so short a time. We would visit polling stations, speak to candidates, party workers and activists carrying out canvassing, as well as local journalists based in Istanbul. We sought to gather information about the general political situation in the country, the key issues on the agenda and the prospects for political developments especially with regards to the peace process. The elections were taking place against the backdrop of some difficult circumstances for the government and as such the poll was regarded as a test for the AKP and for Prime Minister Erdogan’s personal standing. His hardly disguised ambition is to run for the presidency later in the year and possibly to remain in power until Turkey celebrates its centenary in 2023. Whether Erdogan would have a chance of coming even near to realising his political ambitions would be very much dependent on a successful outcome for the AKP in these municipal elections, but his increasingly autocratic rule manifested shortly before polling day in attempts to suppress social media and on top of this there were ongoing allegations of corruption and the emergence of an acute conflict with supporters of the influential exiled Muslim cleric Fethullah Gulen. In fact, all these issues are very closely linked. The corruption case concerning bribery of officials and the alleged awarding of illegal permits for lucrative building projects came out into the open in December 2013 when businessmen close to the Prime Minister and three ministers’ sons were detained. Three members of Erdogan’s cabinet were forced to quit. Erdogan’s response was to talk of an international conspiracy against him and controversially he decided to tighten controls on the Internet, banning Twitter for two weeks and making accusations against judges and prosecutors involved in the investigations of the alleged corruption. Erdogan branded this affair as an attempted “judicial coup” inspired by Gulen. The election was thus a vote of confidence in the Prime Minister and his eleven-year rule. The peace process with the Kurds was an important factor in the election too even though it was not the main topic of debate. The main oppositionparties, the CHP and the MHP, were strongly opposed to any peace process, so any strengthening of their support would have been interpreted as a setback to any prospects of negotiations making it extremely difficult to put the informal talks on a more formal basis, as is the demand of the Kurdish side. The elections were also important for the fortunes of the BDP and its new ‘’sister party’’, the new People’s Democratic Party (HDP), which was fighting an election for the very first time in places such as Istanbul. During our talks with members of the BDP in Istanbul we were informed about the founding of the HDP and the rationale behindthe political strategy of the new party, which was established in October 2012 after a period of negotiations with various activist groups. The HDP isa coalition of progressive democratic forces and an attempt by the Kurds to reach out to more supporters among the Turkish population and its diverse communities. For example, representatives from the Armenian community were prominent in the party and were among those whom we met and interviewed during the visit. It is very important to stress, as we were informed, that the HDP is the culmination of the political project developed by Abdullah Ocalan of building a strong alliance of progressive social forces in order to achieve the democratic transformation of Turkey as a whole. The party had adopted a progressive social programme that included civil rights for minorities in education, better healthcare and employment rights. It campaigned on the issue of peace as an essential prerequisite for democratisation and social advance. Women and younger people were at the forefront of the party and we noticed that the party’s election literature also boldly expressed support for the rights of gay and transgender people, which reflects the cosmopolitan and liberal culture of Istanbul. But the purpose of the visit was not simply to observe the election process, important though that was. We wanted to obtain up-to-date information on the wider issues relating to social, political and human rights in the country, given the context of the authoritarian tendencies of the current government and its ambiguous attitude towards resolving the Kurdish issue in particular. Education, freedom of expression, the position of lawyers and former political prisoners recently released were all of concern and featured as part of our full programme of activities. We were involved in an exhaustive and productive series of meetings with a broad spectrum of organisations which covered in detail many of the issues aforementioned. The city is immense and a place of enormous contrasts – of wealth and poverty, commerce and culture, ancient and modern. The contrasts are powerfully evident in the skyline which we observed in all its glory during a boat trip across the Bosphorus from where we could see the gleaming skyscrapers of the new financial district that one local described to us proudly as rivalling Manhattan. These sit alongside the great mosques with the minarets that dominate the older parts of the city. The great sprawling mass of streets and buildings stretching over two continents is impressive and daunting. The steep inclines of the narrow streets have to be negotiated wearily as do the huge and cracked kerb stones. The traffic is a hazard both in terms of noise and the seemingly erratic nature of the driving especially off the main thoroughfares. Our small hotel was located was within minutes of Taksim Square and Gezi Park, which was the site of big protests about a year earlier. Gezi Park is one of the few open green spaces in the centre of the city and was totally quiet on the evening that we visited. Our guide and interpreter was a participant in the Gezi protests and told us of how the protests had brought people together and how those involved had established their own democratically run community in the park with regular supplies of food and medical assistance. She said the ‘’spirit of Gezi’’ lived on even though people were no longer occupying the square. It was one of the aims of the HDP to build on that spirit of Gezi and channel the widespread public opposition to the AKP’s autocratic rule into a progressive and constructive political direction. The park’s current quietness and emptiness presented a marked contrast to the constant commercial activity going on in the streets just a few feet away where tourists mingled with local people along the heaving boulevard where all the department stores, cafes and markets are to be found. Circling Taksim Square are many of Istanbul’s expensive hotels and in one of which one our planned meetings was to take place; the opulent Marmara Hotel where the rich and powerful of Turkey and the world inevitably stay when visiting the city incongruously overlooks the scene of last year’s popular protests whose too brief upsurge of communal spirit our guide had recalled with evident pride and justifiable affection. Also beyond the thick glass panes of the five star hotel can be seen numerous poor street vendors with their old carts plying bread rings with sesame seeds -Simit -roast chestnuts and kebabs; the poorer looking sell plastic lighters and lottery tickets from bags and upturned boxes. The saddest looking of all the street sellers are the aged women, the disabled and children huddled in corners forlornly holding up packets of tissues to the passers-by. One man pulling garments from a sack tries to sell us a shirt that had seen better days. Business is hard and the rewards must be very meagre indeed. The packed thoroughfare down from Taksim Square is apparently the place to be seen by locals and tourists alike. Each evening it is filled with waves of people, mostly groups of youths and couples, walking; they walk with some determination and the walking seems never to stop. The bright neon lights of the shops sell branded goods, designer clothes and traditional items like the ubiquitous Turkish delight in attractive boxes of numerous colours and sizes to catch the eyes of passing tourists. Window shoppers have to be resilient to resist the blandishments of the shop workers hired to talk and entice the unwilling into buying. The enormous hotel window provided an ideal opportunity to gaze down on the square – a traditional focus of political conflict and where an appalling massacre of labour activists took place on May Day in 1977 which left some 40 dead and hundreds injured. Erdogan had imposed a ban on protest marches in the vicinity of the square and on election night we witnessed one side of the square lined with heavily armoured police vehicles ready to clampdown on the slightest outbreak of protest. There were no clashes on this occasion, but clashes were to re-emerge in the area during this year’s May Day when thousands of trade unionists sought to defy the ban on marches and gain access to the square. The people were beaten and teargased. As stated, in places such as Istanbul where we were observing the nationwide election, the BDP was standing as part of the HDP. The party’s two candidates for the Beyoglu district of Istanbul were an architect, who had been leading opposition to urban redevelopment schemes, and the sister of a victim of the Roboski massacre. 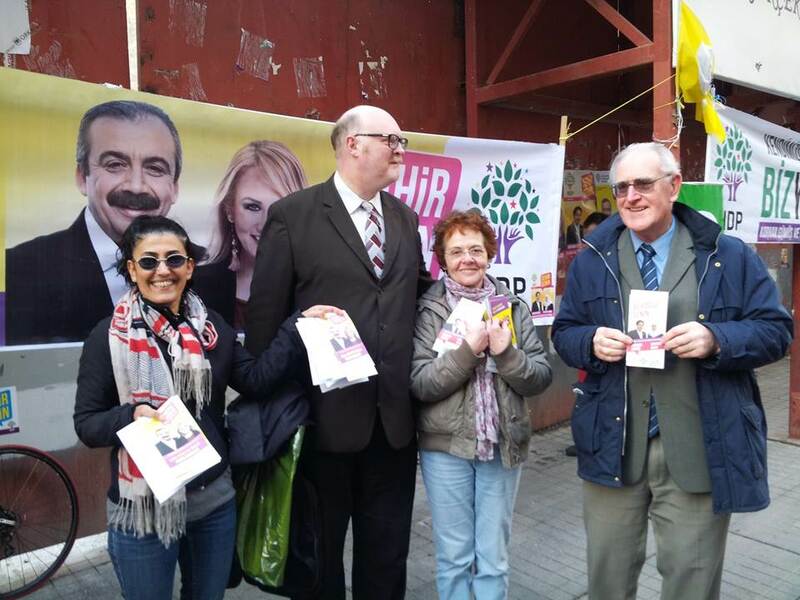 We were able to visit an election stall just before formal electioneering ended on the eve of polling day, Saturday evening, where we demonstrated our solidarity with the HDP by joining its team of party members distributing leaflets in the street in the busy shopping district near Taksim. Evaluating the results with HDP colleagues, we were told by a party spokesperson that as a new party its expectations were not so high and that it had still to achieve a major breakthrough. As a new party it had faced organisational challenges and also had financial difficulties. Quite clearly the party with the most money to spend is the AKP which was obvious to us from the huge number of billboards and wall posters in public places displaying the AKP’s candidates. Additionally, we were informed that broadcast media coverage devoted to the HDP and BDP – the latter now invariably described as an exclusively ‘’Kurdish party’’ – was both minimal and not favourable. So as a small party the odds are stacked against the HDP and BDP which is an unfairness embedded in the whole contest; a similar situation as pertains in other countries however. The HDP will need to develop its political campaigning to address the concerns of the people and attract more support. However the attitude of the party remains positive and its next immediate challenge will be the election for the presidency in August 2014. The Istanbul candidate for mayor was a strong one but had to work for the peace process as a film director, which had led to his absence from Istanbul during much of the campaign andmay have been a factor in deterring support. The HDP achieved more or less the same level of votes as the BDP in 2009 which suggests that it has still to widen its electoral base if it is to fulfil its promise of reaching out to new voters and achieving a real breakthrough. We were privileged to have been granted physical access to a polling station in the centre of Istanbul which allowed us to witness for ourselves the people going in to record their votes in the polling booths and dropping them in the ballot boxes. This was a fascinating experience and gave us a valuable insight into the procedure which appears to be not unlike our own. We should stress that everything appeared to be above board at this specific polling station; there seemed to be no undue pressure or influence brought to bear on people lining up to vote. We saw that votes are recorded by the individual stamping their chosen candidate then placing the ballot in a sealed envelope. However, we were not permitted to stay long as after a few moments we were noticed by an official from one of the rival parties who objected to our ‘’disruptive’’ presence and we were obliged to leave. We cannot disclose the precise location of this polling station as there might be repercussions for the authorities who granted us access. We respect the confidentiality of the host and pay tribute to their hospitality and trust. Clearly we were not a witness to any instances of fraud but we were told of several examples where voting irregularities had taken place and as a general rule it can be stated that these seemed plausible. The accusations were in the main levelled at the ruling AKP as its control of the machinery of state gave its officials ample opportunities to abuse their powers. Whether the acts of fraud were purely locally inspired initiatives or secretly co-ordinated from the centre is another matter; this is unclear given the lack of transparency in the process. Whatever Turkey is, it is not a country that that enjoys a reputation for exercising the principles of open government. Therefore, the examples of fraud that we cite in our report are based on the stories that we were told and are corroborated with selected press reports. Fears of manipulation and fraud surfaced following power blackouts that occurred across Turkey during election night as votes were being counted. We regard this as one of the most bizarre aspects of the election. It seems too much of a coincidence that blackouts could have occurred at precisely the moment that ballot boxes were being opened and votes counted. The entire incident is clearly calculated to foster rumours and in such a situation people will believe what they want to believe. What follows is compiled from various press reports. In response to allegations made by opposition parties, the country’s Energy and Natural Resources Minister Taner Yıldız denied categorically that there had been any wrongdoing. Yıldız, speaking after voting was completed, was quoted in the press as stating: “In the eastern Mediterranean cities of Mersin, Adana and Gaziantep, there was a storm with winds reaching 75 km/h. In addition, there was heavy snow in eastern Anatolian cities like Erzurum and Ardahan. These weather conditions caused some local power outages which didn’t affect the vote counting.” It is noteworthy that the minister failed to address complaints about power outages in western cities such as Istanbul, where the weather conditions were very mild and seemed to have caused no problems, as we can testify. Widespread reporting of fraud marred the historic local elections seen as a nationwide referendum on the government and which saw some 53 million people voting. Thanks to vigilant observers, attempts at fraud were exposed early in the day on the Sunday of voting while rumours of widespread fraud circulated widely among social media users. It was reported that in the Tatvan district of eastern Bitlis province, a complaint was made by election observers because ballot slips had been pre-sealed without the knowledge of the local election board. When the chairman of the election board brought in completed ballots that had been sealed at home, other members of the board objected and made an official complaint. Although the Supreme Election Board (YSK) had announced that all measures to prevent fraud had been taken, this did not dispel public concerns. Liberal Democratic Party (LDP) leader Cem Toker reported on Twitter that a member of his party had filed an official complaint in Üsküdar when a ballot official insisted that voters must use a pen provided by him. There were also rumours that AKP supporters had been providing pens with erasable ink in order to amend the votes later on. A similar complaint was made by a Twitter user about a ballot box in a district of Ankara. According to various social media users, hundreds of cases of fraud were detected and official complaints were filed upon the objections of citizens. Dozens of people shared images of the official complaints online in an effort to expose the attempts at fraud. In response to reports of election fraud, the main opposition Republican People’s Party (CHP) filed an official complaint with the Ankara Public Prosecutor. The complaint was filed based on reports that the party claimed to have received from across the country. The chairman of a ballot box in Adana reportedly made people sign empty sheets. In Ahmet Hamdi Tanpınar Primary School in Bursa, an election observer from the AKP reportedly instructed people to vote for his party. In İzmir, sealed ballot slips with votes for the AKP were found in a car bearing the license plate number 35 AC 9019. The driver was detained and an investigation was launched. In the Çankaya Secondary School in the Mediterranean province of Mersin, 1,064 “yes” ballot slips for the AKP were discovered and reported. In Gaziantep, ballot slips with the AKP seal without any envelopes were disregarded. It was also discovered that 65 voters in Ali Haydar Albayrak Primary School had not been given ballot slips for the mayoral elections. Buses operated by the İstanbul Metropolitan Municipality were apparently used to transport AKP voters to poll booths. The drivers claimed that they were transporting officials and ballot boxes. While the evidence of fraud in elections is always a cause of great concern, the cases of fraud that emerged in Turkey’s recent election seem to have been intermittent and although quite widespread were not sufficiently systematic to have swayed the result by itself. The fact is that Turkey emerges from the elections as a deeply divided country; while Erdogan claimed victory, the strength of opposition to his regime is also strong. The election confirmed the political dominance, for the time being at least, of Erdogan and the AKP. His confidence boosted by the outcome, Erdogan delivered a victory speech at a party rally which included thinly veiled threats to his opponents who had tried to defeat and undermine him; commentators understood the main target for the threat to be the Gulenists.in terms of the future of the peace process, Erdogan’s clear victory gives him the leeway to pursue an historic peace deal with the Kurds should he so wish. The level of support for the BDP held up despite challenges from the AKP in certain localities and the allegations of fraud which tended to favour the ruling party. Support for the HDP was also encouraging though not particularly spectacular; but in Istanbul, the HDP pushed the MHP into fourth place, which is certainly highly encouraging and well worth celebrating. 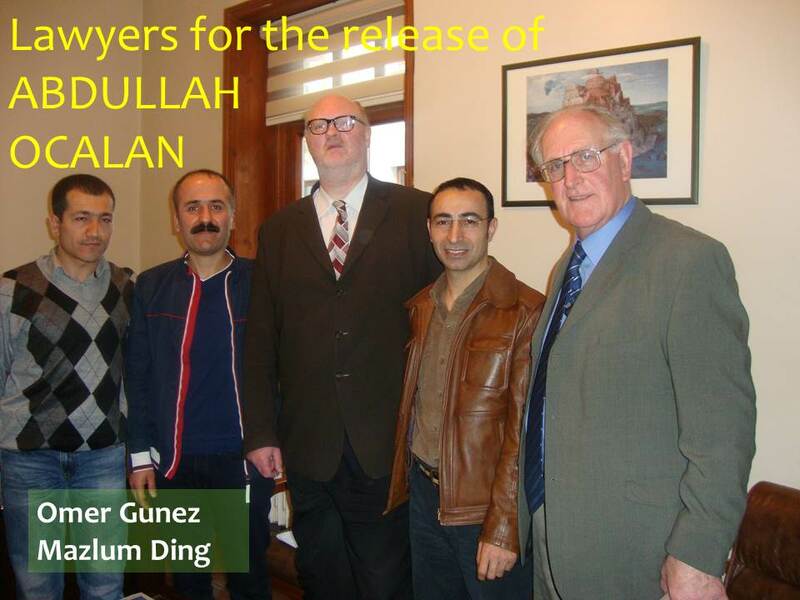 We were fortunate to have an interview with two recently released lawyers who are part of Abdullah Ocalan’s team. They had been freed only ten days previous to our meeting and were still pleased to be breathing the air of freedom. In this part of the report, we can only summarise briefly the conversation that took place between us through the services on an interpreter. We cannot provide a full transcript in the space available but would like to stress some key points that people should be made aware of. We were greatly impressed by their courage, tenacity and how they remained undaunted despite the experience of their incarceration. The lawyers were accused of acting as a mouthpiece for Ocalan and transmitting his instructions to the outside world. We were told that even the secretary to the law firm had been targeted by the state operation and had fled to Germany to avoid arrest. In all 37 lawyers had been arrested; five had been released. The two that we met had been in prison for 2 years and 4 months. Their arrest was purely and simply an attempt by the state to demonstrate that Abdullah Ocalan is a force for evil, we were told. In fact, for the Kurds and many more besides, Ocalan is a political prisoner unjustly detained and a key to unlocking the stalled peace process. Furthermore, Ocalan resembles a ‘’Kurdish Nelson Mandela’’ and the similarities were clear to see; these were impressed on us, but we broadly shared the opinion of our hosts in this matter. The state was playing a political game with Ocalan and had started a dialogue but had put it on hold recently. What was required was greater transparency in the process and this should be achieved by putting the talks on a more formal basis. This is one of the key points that was repeatedly made to us was that people who support the Kurds and the peace process should take it up as a campaigning issue in the UK. Much of our discussion concerned the conflict that had arisen between the AKP and the Gulenists, the details of which we cannot explore. Suffice to say that the fear was that the Kurdish issue would be obscured or embroiled in the conflict. One point that was made was that the AKP feared that the Gulenists would seek to win support from the Kurds and that the releases may have been timed to win support for the AKP in the elections. ‘’The arrests were political and their release was political also’’, it was stressed. It should be stressed that their release does not mean that the case against them had been dropped. The cases continue. Also the conditions of their release are tough; they cannot work as lawyers and if they are ultimately found guilty they would entirely lose the right to work as lawyers. They could also face jail terms of up to 22 years. The arrest and persecution of lawyers was part of a change of strategy by the state in response to the Kurdish movement. No longer were they arresting youths on marches or involved in protests; the state was now targeting the professionals involved at various levels in the leadership of the movement. This is a political decision and should be strongly emphasised and clearly understood by those outside Turkey who want to see the achievement of democratisation and peace. The lawyers stressed that their political commitment was shaped by their own family background and experiences as Kurds living in Turkey; they were not motivated by the PKK in the simplistic way as the state alleges. Their families had suffered forced assimilation and members had ‘’disappeared’’ in the years of conflict. The Kurds had endured a deeply tragic history and were a traumatised community and to this day they still lived in fear of reprisals and could not openly express their views in public. A similar situation confronted other minority communities in Turkey such as Alevis and Armenians. We were told that the Kurds supported Abdullah Ocalan even though he has been in jail for 15 years because he represented their opinions and hopes. Like Mandela had been, he was loved and respected by his people. It was inaccurate to say, as was sometimes implied in the western press, that Ocalan was feared. During Newroz millions of Kurds had demonstrated their support for Ocalan and risked prosecution and imprisonment by carrying his photographs and holding up banners with the colours of the PKK. Other meetings that we held focused on the situation facing journalists especially when they were seeking to report on controversial issues such as the Kurdish movement and the peace process. A meeting was held in the offices of Ozgur Gundem with some of the courageous journalists from this newspaper that has suffered an exceptional share of persecution over the years. During our discussions, journalists expressed their frustrations at the slow process of advances in human and civil rights in the country. They explained the many obstacles that reporters confronted in carrying out their work. Over the years 78 journalists from Ozgur Gundem have been killed and its offices have been raided and attacked on countless occasions. Hopefully, this kind of direct oppression is in the past, but today the state is simply much more sophisticated and oppressive measures continued, we were told. Censorship remained in force and journalists were faced with obstructions from the authorities such as the withdrawal of press cards. The state continued to compile dossiers on particular journalists who write controversial articles and these could be brought to prosecution at a later date. This was a clear form of intimidation and direct intrusion into the daily work of the press. The journalists also strongly expressed their concern at the unfairness in reporting on the election campaign. We were told that the state exercised all its power in favour of the ruling party, the AKP, and that the state controlled media was systematically biased. The monopolistic power of the state TV and radio rendered the election an unfair race. To give an example of this unfairness, we were told that the AKP had been allocated 34 hours media coverage while the HDP/BDP had only been granted two minutes air time. There had been over 100 attacks on HDP activists during the election campaign but these had not been reported in the state media and neither the government nor the mainstream opposition parties had spoken out to condemn such incidents. We were also informed by the journalists that the BDP was seen as a threat and that the other parties were involved in a secret pact to support each other to defeat the BDP in specific areas where the party was strong, such as Bingol Province. In such areas, police would follow journalists in order to intimidate them and prevent them reporting accurately what was taking place. It was also stressed that journalists were still facing jail and prosecution as part of the so-called KCK trials and these should not be ignored. The precise figures for the number of journalists currently in jail is unclear but, according to human rights campaigners, it is still believed that Turkey to this day has the worst record in the world in detaining journalists. We gained further insights into the role of the independent media in Turkey by visiting the offices of BIANET, which was an electronic media network established in 1999 with European finance. It employed 12 members of staff and was able to approach the news in a different way to the heavily controlled state media and the private commercial agencies. As such it was a valuable addition to the totality of Turkish media and was making an important contribution to greater diversity, which was much needed. Its English language service can be highlighted and people should visit the BIANET website to gain an insight into its work. We also held a meeting at the office of teachers’ union, Egitem-Sen, which enabled us to learn about the current situation regarding Kurdish language education among other issues with Husein, the president of the third branch of the union in Istanbul. The teaching profession in the country was a respected one but its economic status was not high; compared with OECD countries, Turkish teachers worked much longer hours and earned far less. This was the situation throughout the country. Education in the private schools was a part of the AKP’s conflict with the Gulen movement because Gulen was responsible for running many schools all over the country. Concern was expressed that Gulen was using education to promote its version of Islam in the private schools and exerting its influence this way. The extension of religious education in state schools was also seen as a challenge in that it was having an impact on the teaching of other subjects, such as science and evolution. The scenario seemed to resemble in part the conflict between Creationists and the teaching of Darwinian evolution in some states in the USA in this regard. Nevertheless, a key issue that the union wanted to highlight was the fact that some of its officers and members had been detained as part of the clampdown in Kurdish organisations. In February 2013 the union general secretary and 160 members had been arrested accused of supporting ‘’Kurdish policy’’. Some 70 members were sentenced to a year in jail; at present 10 members of the union remained in jail on charges of expressing support for the peace process. The union urged us to bring such cases to wider public attention in the UK and by highlighting the cases we might exert some influence. A meeting was held with a director of the Memory Centre which was engaged in investigating the circumstances surrounding the number of people who became ‘’disappeared’’ persons during the years of conflict. This NGO was established as recently as 2010 and was carrying out very valuable work in assisting the country to come to terms with the appalling suffering that continues to be inflicted on those families, predominantly Kurdish, who were victims of a state policy of enforced disappearances as the Turkish state fought a dirty war against the Kurds. 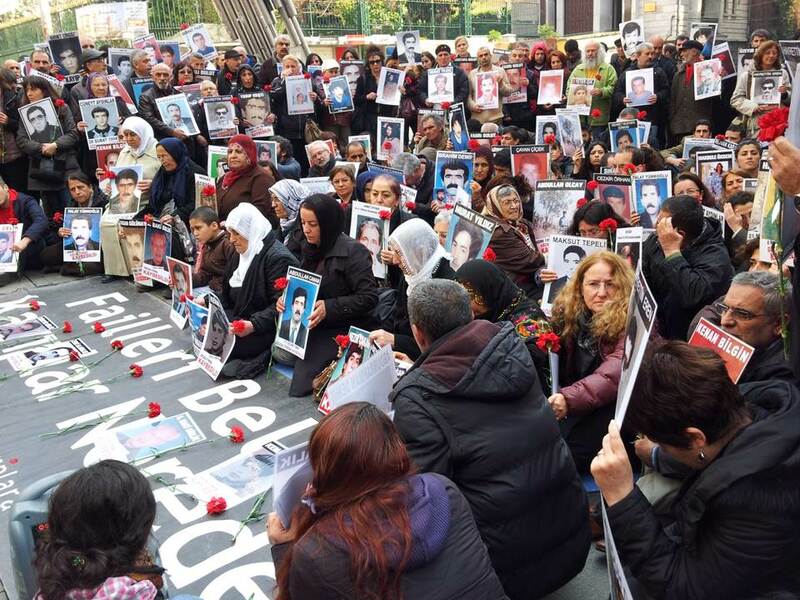 The situation of the disappeared has for several years been brought to public attention by the courageous activism of the Saturday Mothers vigils, and we were extremely privileged to have been able to join one of these vigils ourselves during our visit. We should also like to draw people’s attention to the report documenting the cases of the disappeared that has been produced by the team of dedicated researchers working at the Memory Centre. This is titled ‘’The Unspoken Truth – Enforced Disappearances’’ and, we believe, can be found online. In summary, we would like to state that the visit proved invaluable in gathering information about the current situation inside Turkey and the prospects for a peace settlement with the Kurds. We were tremendously impressed by the courage and dedication of everyone whom we met; they generally remain optimistic about the future of the country and believe that a final resolution of the conflict is within grasp, but this is not a certainty and ultimately depends on many factors, including the pressure and persuasion that can be brought to bear on Turkish leaders from their partners in the European Union and friendly countries such as our own. As human rights defenders and activists who want to see a full democratisation in Turkey with equal rights for all its citizens enshrined in law and implemented in daily life, we believe that the Kurdish communities outside the country and their friends have a vital role to play. Highlighting continued abuses of power and backtracking by the Turkish authorities and the dangers of a drift into authoritarianism. We would like to express our thanks to everyone whom we met in Istanbul for their hospitality and for allocated their time to assist us during our visit. We especially thank our guides, hosts and those who acted as our interpreters during the many meetings that we held. The support that we received was invaluable. We express our solidarity with all those involved in the struggle for a truly democratic Turkey where everyone can express their opinions freely and express their identity without fear of persecution.